Looking for the Best Six Person Tent? When comparing all of the products in our top five reviews below, we recommend the CORE 6-Person Instant Cabin Tent as the best 6-person tent. It provides with enough room for multiple beds or sleeping bags. 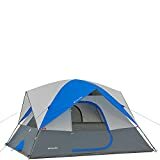 The tent even has a good center height so you can stand up straight, which can be beneficial for taller individuals or if you want to change clothes without having to crouch. Beyond having space for you and your camping guests, there's space for smaller items as well. The tent has a gear loft that has numerous of pockets so everyone can stash their things without getting in the way of each other. There's even a good deal of weather protection so you can enjoy the tent in various outside conditions. Camping should be fun for the entire group, so much so that you may want to do it time and time again. With that said, it means little without the appropriate tent. So that you and your camping buddies have the most enjoyable experience as possible, we came up with top five, top-rated 6-person tents. Our reviews address both benefits and negatives about the tents in question to help you come to a decision. Before the reviews, however, we'll discuss everything you should know about tents of this size before buying one. This way, you may have an easier time deciding which on our list is best for you. Choosing what is best for your needs isn't always a straightforward process. We aim to help simplify it all, and that's first done by providing you with more information about important aspects and features to keep in mind about 6-person tents such as space, reliability, and ease of use. Just because something says "6-person", that does not mean it can exactly fit six adults comfortably. Check out just how much interior space you have, both width and the center height. This can let you know if you can fit two queen air mattresses, a queen and some twin beds, several sleeping bags, etc. Need A Bigger (or Smaller) Tent? From there, look at who you're bringing along. Two adults and a few children fit differently than several adults or several children. Once you realize you have space for you and anyone else you're camping with, you need to consider the gear that's brought. Many tents have a vestibule or a porch that can be used as a place to store other equipment. This way, it's kept out of reach and sight from the sleeping area so you and guests can rest in comfort. Even if a tent doesn't have that, it may have a gear loft. A gear loft, in particular, large ones, allows everyone on the trip a space to store smaller items. Because the gear lofts usually have separate pockets, each person's items are kept separate. It may be one of the best accessories to find in a tent for multiple people as everyone has space. Some tents are better used in certain conditions than others depending on the materials used to make it. Are you planning on camping in colder weather? Look for a tent that offers quality insulation. This way, you'll know you'll be kept warm even on frigid nights. On the other hand, are you camping during a warmer period? Vents and windows are essential to pay attention to here. The right amount can force hot air out while circulating cooler air efficiently. Of course, those types of tents can make it too cool for colder nights, while insulated tents tend to have issues with air circulation. That's why it's best to buy for the particular season you're camping in. Now, some tents are made as year-round, multi-season tents. By using one of those tents, you may open yourself up to being able to camp anytime anywhere. These tents may run the risk of being more expensive than others, however. Having a tent with weatherproofing factors is always a good trait to keep a lookout for. You not only want your tent to last, but you don't want to find yourself suffering in an unexpected rainfall or heavy winds. So, take a look at the material, and you can discover how much protection you're getting. To start, look to the rainfly. One that offers optimal coverage so that rain doesn't slip inside is ideal. Other things to look at are features such as heat-sealed seams. This ensures that rain, no matter how heavy, won't seep through the seams and soak the inside of your tent. Other weatherproof traits are the poles. They should be of high enough quality to fight off winds. If for any reason, they're not, you can always upgrade the poles to something sturdier. Another aspect to consider when buying camping tents this size is to think about how easy it is to setup and takedown. Who wants to worry about spending hours trying to put together a complicated tent? Find tents that are quick to set up and just as easy when coming down. This way, you can get to the fun part of camping faster. Color-coded markings sometimes aid in quickening the setup procedure. Also, there are instant tents available at this size. This also improves just how long you'll have to spend setting up one tent. One person or more should be able to get these tents going. Once it's broken down, it does benefit a tent if it can fit back inside the carrying case it came with. In its 6-person size, the Slumberjack Trail Tent provides you with two vestibules that you can use to store other gear. This way, you are given more sleeping space inside the tent. Another feature that helps create more room is the fact that the design uses ridge pole geometry that maximizes the interior width. If you're looking for some more storage options, this tent does provide some internal storage pockets. To keep everything dry, it features a full-coverage rainfly that holds well even in windy weather. Though the bottom of the footprint may feel wet after rain, moisture doesn't seep through so that you remain dry. 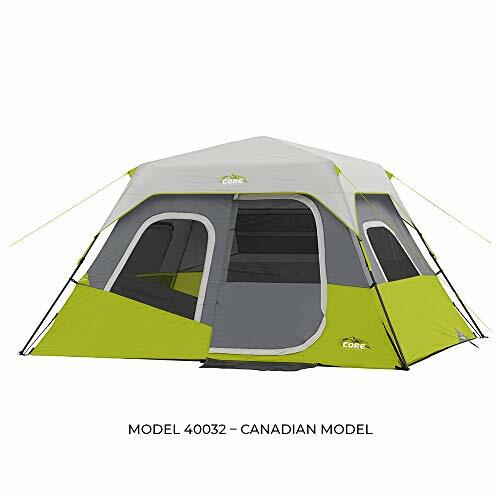 In spite of its size, it's not a heavy tent for car camping or family camping trips. It's also relatively easy to set up even if the directions aren't entirely easy to follow. It features color-coded clip construction to help speed up the process to the point that one person can easily set it up and break it down alone. 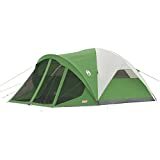 Slumberjack Trail Tent is a mid-range tent that offers a good deal of room for group camping as well as space to store gear thanks to two vestibules. Coleman Evanston Screened Tent is a top-rated tent concerning just how much space it gives you all around. The interior has a 6' center height. So, many people can find themselves standing up rather comfortably. There is also plenty of room so that you can fit more than one large mattress inside, making group camping trips all the more fun. It has a good amount of circulation, and the extended window awnings help you keep the windows open and stay dry even in the rain. Further ventilation is found in the screened-in porch. It allows for lounging without worrying about bugs as well. To store some small items, you can use the mesh pockets on the sides of the tent walls. Also, you may even want to use that screened-in porch to keep muddy shoes away from other items. Do note that the rainfly doesn't cover it so that things can get wet in a downpour. However, the rest of the tent is well-protected from moisture. The Coleman Evanston Screened Tent is the best tent for lounging in a bug-free environment while still soaking in the outdoors thanks to the screened porch. CORE 6-Person Instant Cabin Tent features a quick setup system, which you may enjoy if you want to pitch in a hurry. It has a pre-assembled frame so that it takes less than two minutes. Also, it takes just as long to take it down and load it into the carry bag once you're finished. Though this tent has enough room to fit multiple beds or sleeping bags, there's also a good amount of space for everyone's gear to have its own spot. This is all due to the gear loft that comes with several pockets to keep everyone's items in their place. To make the camping experience even more fun, there's an electrical port and a lantern hook. For protection, the rainfly takes no time to put on, and it covers well. The tent also features H2O block technology. This includes sealed seams, water-repellent fabrics, and rain-resistant window seals and door. If it gets too warm, there are adjustable air vents and a mesh ceiling to push hot air out. 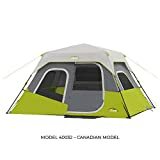 The CORE 6-Person Instant Cabin Tent may be the best tent of this size that gives everyone their own gear space and keeps the air circulating well thanks to the vents and the mesh ceiling. Kodiak Canvas Flex-Bow 6-Person Canvas Tent is one of the more expensive tents you can find, but its value is seen in its material. The use of canvas ensures a good amount of durability. Moisture, even the heaviest of rains, has a tough time cutting through, which means you stay nice and dry. It doesn't even flap around in the wind as canvas is naturally quieter than other material. The fabric is also breathable. What helps more with the circulation are the two tunnel-flow vents. They also aid in providing you with better temperature management. This further asserts this tent a year-round tent since you can adjust according to your needs. To make things more comfortable for everyone, the tent has a rather large awning for a covered, shaded entry. On the inside, it has a customizable gear loft with organizer pockets. The Kodiak Canvas Flex-Bow 6-Person Canvas Tent is your go-to year-round tent that offers tough durability for long-term use while providing ample space. Columbia 6-Person Dome Tent is a low-cost way of enjoying a car camping trip, trip to the park or even having fun in the backyard with a group. It has a fast clip setup system so you can get to enjoying your time fast. Also attaching the rainfly is simple, but due to its design, it can accumulate water via condensation. Though condensation may become an issue with the rainfly, the tent does have some generally decent water repellency features. It may be able to hold well enough in light rain and light wind also. If it's muggy outside, especially after rainfall, the tent offers good venting. There is some good space inside for you and your group along with small items people may want to store. You can all do so in the built-in gear loft. More so, there are also two storage pockets on the walls designed to hold even more small items that may get in the way. The Columbia 6-Person Dome Tent is an inexpensive way to let your group camp in comfort thanks to the gear loft and additional storage pockets. Who is the best tent manufacturer? Which are the best camping tents for family adventures? Choose the best cabin tent for rain by reading our buyers guide. Need some new aluminum tent stakes? Check out our guide to the best stakes for camping. Needing some 12 volt fans for camping?